1970-01-01. New. Ships with Tracking Number! INTERNATIONAL WORLDWIDE Shipping available. Buy with confidence, excellent customer service! 1991-09-06. New. Ships with Tracking Number! INTERNATIONAL WORLDWIDE Shipping available. Buy with confidence, excellent customer service! American West Pub. Co, 1970-01-01. Loose Leaf. Used:Good. 1991-09-06. Good. Ships with Tracking Number! INTERNATIONAL WORLDWIDE Shipping available. May not contain Access Codes or Supplements. May be ex-library. Shipping & Handling by region. Buy with confidence, excellent customer service! University of Nevada Press, 1991-04-01. Paperback. Used:Good. Berkeley: The Friends of the Bancroft Library, 1968. Hardcover. Illustrated with the original cartoons by Herb Roth. Biographical and background information by Dolores Waldorf Bryant. Grey pictorial cloth. xi, 92pp. Frontispiece, illustrations. Very good. Keepsake Number 16, reminiscences of growing up in Virginia City which first appeared in the "San Francisco Bulletin" in 1905. Berkeley: University of California Press, 1968. First Edition. Hardcover. Very Good-. Illustrated by B&w cartoons (Herb Roth).. 4to - over 9¾" - 12" tall. VG- in cloth (spine tip bumped) 4to 92pp Number 16 in the series of keepsakes issued by the friends of the Bancroft Library for its members. Friends of the Bancroft Lib.. Very Good with no dust jacket. 1968. Hardcover. 1125650842 . No Dust Jacket. Edge wear to boards. Back pages uncut. ; 11.25" tall . Berkeley: Friends of the Bancroft Library, 1968. First edition. Hardcover. Partly unopened. Orig. illustrated grey cloth. Fine.. 92 pp. Profusely illustrated with the original cartoons by Herb Roth from "The Bulletins". Features biographical and background material by Dolores Waldorf Bryant. This integrative volume reprints Waldorf's original stories from the San Francisco Bulletin of the early1900's. Waldorf's works are supplemented with a wealth of background information culled from other historical records and newspapers of the time. Number 16in the series of Keepsakes issued by the Bancroft Library. Condition: Partly unopened. Orig. illustrated grey cloth. Fine. American West Pub Co, 1970. Book. Near Fine. Hardcover. First Edition. Hardcover. American West Publishing, 1970, first edition. In near fine condition, with a very good DJ, small soil mark on front panel, now in mylar. Virginia City in the 1870's, when the town was dirty, noisy, dangerous, exciting, tough - and all silver..
Berkeley: Friends of the Bancroft Library, University of California, 1968 First edition in book form. , 92pp. Covers very lightly soiled and a very minor bump to one corner. A fine copy in printed gray cloth. Designed and printed by Lawton and Alfred Kennedy. Number 16 in the series of keepsakes issued by the Friends of the Bancroft Library. A collection of the author's reminiscences of his Comstock boyhood in Virginia City which were originally published in San Francisco's Bulletin in 1905. Accompanying the text are reproductions of the original cartoons that appeared with the stories, drawn by Herb Roth.. Illus. by Roth, Herb. American West, Palo Alto, 1979. Fine in DJ. American West Publishing. CLOTH. Waldorf, John Taylor. A Kid on the Comstock :Reminiscences of a Virginia City Childhood. Palo Alto, California: American West Publishing, 1970. 198pp. Indexed. Illustrated. Bibliography. 8vo. Cloth. Book condition: Very good; signature & abrasion from removed sticker on front free endsheet. Dust Jacket Condition: Very good; in clear plastic protector. . Very Good. 1970. Palo Alto: American West Publishing Co, 1970. Edited with introduction and commentary by Dolores Waldorf Bryant. [x] 198p., b/w illus., dj. Palo Alto, California: American West Publishing Co, 1970. Hardbound	. 1st Edition, thus. BINDING/CONDITION: a handsome binding - dark emerald green cloth with vignette in gilt; gilt spine text; the jacket and endpapers are a matching olive green shade; a Near Fine book, with a Very Good+ dust jacket; publisher's price on the jacket flap is intact. The jacket would be Fine but for fading at the spine. Book design by John Beyer. Illustrated with black and white photographs. Following is taken from Stanley Paher's Nevada (number 2084): ''The author's reminiscences of his boyhood in Virginia City, beginning in 1873, originally appeared in the San Francisco Bulletin shortly after 1900. These fond remembrances capture the essence of the heyday of Virginia City, when the town was dirty, noisy, dangerous, exciting and tough -- all because of silver. Here is an uncommonly lively and authoritative portrait of the West's largest silver camp.''. 8vo (about 9.25 inches tall)	198 pages. Notes, reading list, index. Olive green endpapers. PALO ALTO, CA: AMERICAN WEST PUBLISHING. VG+/VG. 1970. A Kid on the Comstock. Berkeley. : The Friends of the Bancroft Library., 1968.. First edition thus.. Hard cover.. Fine copy.. 4to.. Illustrated. Prospectus laid in.. Photograph of OUR copy available upon request. PALO ALTO, CA: AMERICAN WEST PUBLISHING. FORMER OWNER'S NAME. VG/G+ WITH SOME WEAR.. 1970. Condition: FORMER OWNER'S NAME. VG/G+ WITH SOME WEAR. Palo Alto: American West Publishing, (1970). First edition in book form. green cloth pictorially stamped and lettered in gilt. Fine/pictorial dust jacket (spine a tad faded, edges barely rubbed, some stains to boards). Quarto. Illustrated with cartoons by Herb Roth Portions of the material originally published in Number 16 in the Keepsake Series, 1968, and issued by the Friends of the Bancroft Library for its members. Palo Alto, CA: American West Publishing Co, 1970 Book. Fine. Hardcover. 8vo - over 7¾" - 9¾" tall. F/G, used, hc, green cloth with gilt text on spine and gilt design on upper, khaki colored end papers, 198 pages. Interior clean, no marks, pages near bright binding tight. Slight edge wear to dj at corners, tiny tear to top edge of lower near spine, spine slightly sunned..
CA: American West, 1970. Hardcover. Very Good/Very Good. Very good in very good dustwrapper. Writing on end paper. Dustwrapper rubbed with a few tears, stains. Please Note: This book has been transferred to Between the Covers from another database and might not be described to our usual standards. Please inquire for more detailed condition information. Reno, NV: University of Nevada, 1991. Softcover. Fine. First edition. Fine in wrappers. Paperback. Book is like brand new, never read. Please Note: This book has been transferred to Between the Covers from another database and might not be described to our usual standards. Please inquire for more detailed condition information. CA: American West, 1970. Hardcover. Fine/Very Good. First edition. Fine in very good dustwrapper. The corners of the binding are slightly worn and have small tears. Please Note: This book has been transferred to Between the Covers from another database and might not be described to our usual standards. Please inquire for more detailed condition information. Palo Alto, CA: American West Publishing Company. Fine in Very Good dust jacket. 1970. First Edition; First Printing. Hardcover. 8vo; 198 pages; Some minor fading and spotting to the spine of the jacket with a very small hole to the front cover and minor edgewear. .
(Berkeley): Friends of the Bancroft Press, University of California, 1968. gray cloth pictorially stamped in black, lettered in gilt on spine. Cover a little sunned, front endpapers lightly browned at edges, ink inscription on front free endpaper, else fine. Quarto. Illustrated with cartoons by Herb Roth Designed and printed by Lawton and Alfred Kennedy. With presentation inscription and signature of one of the contributors, Dolores Waldorf Bryant Number 16 in the Keepsake Series issued by the Friends of the Bancroft Library for its members. Palo Alto, California: American West Publishing Company, 1970. Book. Hardcover. First Edition. Hardcover, (Green cloth with bright gilt titles and line draing cover decoration), 8vo. 198pp. Tight. Illustrated throughout with archival photographs. No names or other markings. Nice d/j with a small edgetear, else Fine in Near Fine unclipped d/j..
Friends of the Bancroft Library, 1968. Hardcover. Good/No Jacket. Cover and spine lightly faded.Inside of cover browned.Back cover scuffed. Palo Alto, California: American West Publishing Company, 1970. First edition. green cloth pictorially stamped and lettered in gilt. Slight mildew marks on covers, else as new/pictorial dust jacket (slightly rubbed). 24 cm.. 198 pages Illustrated . Berkeley: University of California Press, 1968. original gray cloth pictorially stamped and lettered in black. A few scant foxing marks, else fine. Large quarto. Illustrated with original cartoons by Herb Roth from “the Bulletin” Designed and printed by Lawton Kennedy . Berkeley: The Friends of the Bancroft Library/Univ. Of Cal. Press, 1968. Illustrated gray cloth binding, 92 pp. Illustrated with original cartoons by Herb Roth from "The Bulletin" and with Biographical and Background Material by Dolores Waldorf Bryant. Number 16 in the series of Keepsakes. Private bookplate on front endpaper. Size: 4to - over 9¾" - 12". Hardcover. Fine. U.S.A.: American West Publishing, 1970 HARDBACK BOOK AND UNCLIPPED DUST JACKET IN NEAR FINE CONDITION, [$5.95],NAME STAMPED ON FIRST BLANK PAGE. 1st Edition. Hardcover. Near Fine/Near Fine. American West Pub. Co, January 1970. Hardcover. Good/Fair. American West Pub. Co, 1970. Loose Leaf. Good. American West Publishing. Hardcover. 0910118140 Waldorf, John Taylor. 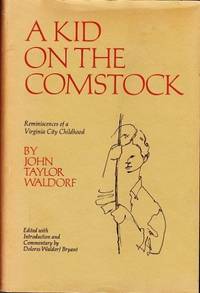 Kid on the Comstock: Reminiscences of a Virginia Childhood. NP: NP, ND. Book condition: Near fine with former owner's inscription on front free endsheet. Dust Jacket Condition: Very good with bumping to extremities and a lightly faded spine. . Fine. Palo Alto, California: American West Publishing, 1970. First Edition. Hardcover--cloth. Near Fine / Very Good. Octavo, 9 1/4" tall, [vi] + 198 pages, green cloth. A near fine, clean, hardcover first edition with light shelf wear to the bottom edges; hinges and binding tight, paper cream white with light foxing to the fore-edges. In a very good lightly edge worn dust jacket with some darkening to the backstrip, with the original price. American West. Used - Very Good. Ships from Reno, NV. Great condition for a used book! Minimal wear. 100% Money Back Guarantee. Shipped to over one million happy customers. Your purchase benefits world literacy! American West Independent Publishing, 1970. Hardcover. Acceptable. Disclaimer:A readable copy. All pages are intact, and the cover is intact. Pages can include considerable notes-in pen or highlighter-but the notes cannot obscure the text. At ThriftBooks, our motto is: Read More, Spend Less.Dust jacket quality is not guaranteed. Palo Alto, CA: American West Publishing Co., 1970. Book. Fine. Cloth. First Edition. 8vo - over 7¾" - 9¾" tall. Dark olive cloth, lettered in gold foil, as issued. Dust jacket shows sunned spine panel, some toning toward edges, a few light surface marks..
American West Publishing. Used - Good. Good condition. Acceptable dust jacket. American West Publishing. Used - Very Good. Very Good condition. No dust jacket. Pages 92 pp.4to. Cloth. 1st edition. Limited edition. Black and white pen and ink drawings throughout.Keepsake Number 16. Near fine condition. Edition: 1st edition. Limited edition. American West Independent Publishing, 1970. Hardcover. Good. Disclaimer:A copy that has been read, but remains in clean condition. All pages are intact, and the cover is intact. The spine may show signs of wear. Pages can include limited notes and highlighting, and the copy can include previous owner inscriptions. At ThriftBooks, our motto is: Read More, Spend Less.Dust jacket quality is not guaranteed.